Breadfruit (Bakri Chajhar or Artocarpus altilis) belongs to the mulberry family and is actually a vegetable. It is often regarded as a type on mulberry. Its birthplace is Western Pacific Islands and Malay Peninsula. It is green in color outside and yellow inside. Breadfruits resemble jackfruit in appearance. Ripe breadfruit rip rather fast and once ripe, it has soft, creamy and sweet flesh. When it is cooked properly, it is very delicious. It is also highly nutritious. This vegetable is very beneficial for your health as well as your skin and hair. The antioxidants present in breadfruit help in protecting your skin from the harmful rays of the sun and prevent any damage done due to exposure to the sunlight. It also encourages the growth of new cells. As a result, the damaged skin appears young and smooth. By drinking breadfruit juice daily, you can make your skin tone even and also rejuvenate your skin and make it firmer. The high amount of Vitamin C in breadfruit helps in the production of collagen. This is a protein that is essential for providing elasticity to the skin. If you suffer from any skin infections, you can use the ashes of the breadfruit leaves to get relief from the infection. The latex that is taken from the tree of breadfruit is good for treating skin diseases, like eczema, psoriasis and inflammation. All you have to do is to apply this latex on the affected areas. Breadfruit is good for your skin in many ways. This is because this vegetable is loaded with omega-3 and omega-6 fatty acids. Both these fatty acids are very beneficial for the skin. It is also a rich source of Vitamin C, which offers lots of benefits to the skin. The extract taken from breadfruit can help reduce inflammation. This is because it can inhibit the activity of pro-inflammatory enzymes and prevent excess production of nitric oxide. 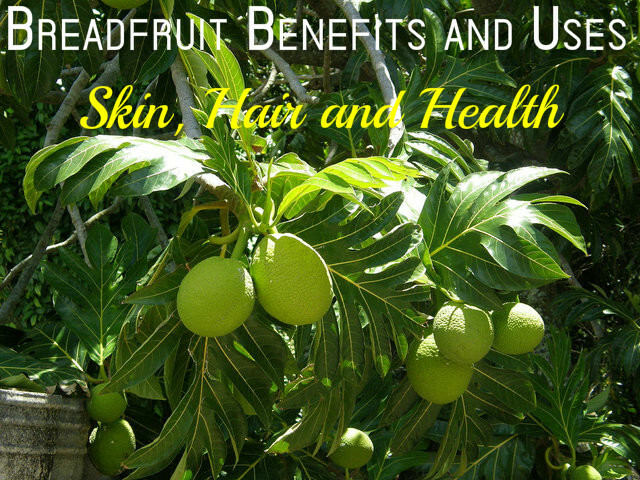 Breadfruit contains all the vitamins and minerals needed for the healthy growth of hair. This makes it ideal for hair. Moreover, omega-3 and omega-6 fatty acids present in this vegetable are also good for hair and works wonders for the hair follicles. Breadfruit improves the resistance power of your body against infections. This is because this vegetable is a rich source of antioxidants. These antioxidants can fight against various radicals that are responsible for causing and age related diseases, thus keeping your body healthy and young looking. By consuming breadfruit regularly, you can make the hair roots stronger and stimulate proper growth of hair. So, if you wish to have thick and healthy hair, have this vegetable regularly. Breadfruit is an excellent remedy for preventing dandruff, itching and thinning of hair. This is because of the presence of omega 3 and omega 6 fatty acids in this vegetable. The fatty acids have the power to regulate the production of sebum in the scalp. This way it reduces dandruff and itching. Breadfruit is also good for boosting your energy. It makes you feel full and at the same time does not increase your calorie intake. So, after eating this vegetable, you feel energetic and active. Consuming this vegetable is also effective for reducing your risk of heart disorder as well as cholesterol problems. Studies have shown that consuming breadfruit regularly helps in lowering the levels of bad cholesterol and increasing the levels of good cholesterol in the body. Breadfruit contains fiber in high amounts. Fiber is very beneficial for people suffering from diabetes. Research made on breadfruit shows that people suffering from diabetes can reduce the risk of this disease and keep it under control by consuming this vegetable regularly. This it does so by reducing the amount of sugar absorption by the body. Breadfruit is also an ideal diet food. Consuming breadfruit is a good option for those who are suffering from overweight issues. It is low in calories and high in fiber. This makes it great for overweight people. The fiber in this vegetable can fight body fats and cellulites. Dental health is also assured by consuming breadfruit regularly. It can provide you relief from toothache and gum problems. To cure thrush, apply crushed leaves of breadfruit on your tongue. Consuming breadfruit regularly is good for the proper movement of bowel and also for the proper functioning of the intestine. The large amounts of fiber present in this vegetable helps in passing the stool and also flushes out all toxins from the intestine. Breadfruit can prevent digestion-related problems lie acidity, heartburn, ulcer and gastritis. It also protects the mucous membrane of the colon and protects you from chemicals that can cause cancer. This vegetable is rich in omega-3 and omega-6 fatty acids. These two fatty acids are very beneficial for your skin and hair as well as the health of your heart. Omega 3 fatty acid is great for the growth of brain and mind. According to the opinion of experts, if children consume breadfruit regularly, it can help in the development of their brain to a great extent. You can cook mature but unripe breadfruit. Cut it into cubes and add it to stews, curry, soups, baking and stir fries. Another way is to cut it into thin slices and fry these slices like potato fries. You can even make chips with it. Ripe breadfruit is often eaten like a dessert. You can add it to puddings, muffins, cakes, sweet bread and so on. So, include breadfruit in your daily diet and remain healthy and free from many diseases.